Replaces hard to find 8908 with 12 pin tubes. 6LF6, 6JS6, 6LB6, etc. Can also use M2057, 8950, 30KD6, 35LR6 with filaments rewired. 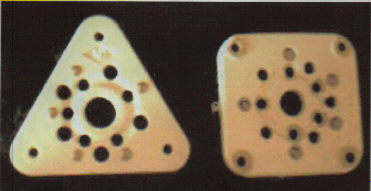 Aluminum plate and grid connectors for 3-500Z, 4-1000, 3-1000Z, 813, 304T, and 100T, 75T, 35T, and others. 3 different outside diameters, 6 different inside diameters. JB 2000, Drake TR 75, etc.